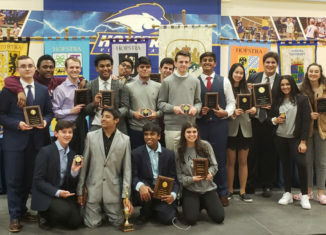 Speech and Debate is one of the most popular and most prestigious clubs at High School East. Over the weekend of April 6th – April 7th, our team competed at the New York State Championship Competition. While Speech and Debate is one large club, there are many sub-categories in which students compete. High School East had students finish as finalists in Novice, Junior Varsity, and Varsity Public Forum & Lincoln Douglas Debate, Extemporaneous Speaking, Humorous Interpretation, and Impromptu. Public Forum involves opposing teams of two, debating a topic concerning a current event. Proceeding a coin toss, the winners choose which side to debate (PRO or CON) or which speaker position they prefer (1st or 2nd), and the other team receives the remaining option. Students present cases, engage in rebuttal and refutation and also participate in a “crossfire” (similar to a cross-examination) with the opportunity to question the opposing team. Those who placed for HSE in the category of Public Forum are listed below. A one-on-one Debate in which students debate a topic provided by the National Speech & Debate Association. Topics range from individual freedom versus the collective good to economic development versus environmental protection. Students may consult evidence gathered prior to the debate but may not use the internet in round. An entire debate is roughly 45 minutes and consists of constructive speeches, rebuttals, and cross-examination. Those who placed for HSE in the category of Lincoln Douglas are listed below. Students are presented with a choice of three questions related to international current events and, in 30 minutes, prepare a seven-minute speech answering the selected question. Students may consult articles and evidence they gather prior to the contest, but may not use the internet during preparation. Topics range from country-specific issues to regional concerns to foreign policy. The speech is delivered from memory. Placing for HSE in Extemporaneous Speaking is Quarter Finalist, Matthew Weltmann. Using a play, short story, or other published work, students in Humorous Interpretation perform a selection of one or more portions of a piece up to ten minutes in length. Humorous Interpretation is designed to test a student’s comedic skills through script analysis, delivery, timing, and character development. Competitors may portray one or multiple characters. No props or costumes may be used. Performances can also include an introduction written by the student to contextualize the performance and state the title and the author. Placing for HSE in Humorous Interpretation was Semi-Finalist, Isabel Kaufman. Impromptu is a public speaking event where students have seven minutes to select a topic, brainstorm their ideas, outline and deliver a speech. The speech is given without notes and uses an introduction, body, and conclusion. The speech can be light-hearted or serious. It can be based upon prompts that range from nursery rhymes, current events, celebrities, organizations, and more. Taking first place for HSE in Impromptu Speaking was Nick Likos.